Luvv Review: Love as an MLM product? Luvv provides no information on their website about who owns or runs the business. The Luvv website does feature a marketing video, however the speaker of the video is not identified. Further research reveals the speaker is Jeff Long, who in another Luvv marketing video credits himself as creator and co-founder of the company. The other Luvv co-founder(s) are not disclosed. Long launched and began promoting Luvv around April, 2018. Read on for a full review of the Luvv MLM opportunity. The Luvv website features no information about the company’s products and/or services. As far as I can tell Luvv has no retailable products and/or services. Luvv offers three affiliate membership tiers, with commissions paid on the two memberships that cost money. Free affiliates earn commissions when they recruit paid affiliates, however recruitment of free affiliates does not generate a commission. Luvv’s two paid affiliate options are Luvv Supporter ($25) and Luvv Abundant Giving System ($100 annually). What commissions and how much a Luvv affiliate earns is determined by how much they’ve paid in membership fees. Luvv Abundant Giving System affiliates earn $5 on recruitment of Luvv Supporters, paid down two levels of recruitment. Commissions on recruitment of Luvv Abundant Giving System affiliates are paid out via a unilevel compensation structure. Luvv cap payable unilevel team levels at five, with affiliates earning $10 per Luvv Abundant Giving System affiliate recruited across these five levels. Luvv Abundant Giving System affiliate recruitment commissions are paid out annually for as long as $100 a year fees are paid. Luvv offers free and paid affiliate membership. The primary difference between Luvv’s affiliate membership options is income potential via the Luvv compensation plan. Jeff Long’s Luvv marketing videos present the company as some sort of movement with the aim of bettering the world. In reality Luvv is nothing more than a pyramid scheme. 100% of commissions detailed in Luvv’s compensation plan are tied to recruitment of paid affiliates. There are no retail commissions paid out, owing to the fact Luvv doesn’t appear to have any retailable products or services. An MLM company paying affiliates to recruit new affiliates as its core business model is a pyramid scheme. Anything built around that, including Luvv’s marketing pitch of “love, kindness, & positive messages”, is marketing fluff. In the Luvv marketing videos I watched, Jeff Long goes over “love cards” and “love wear”. 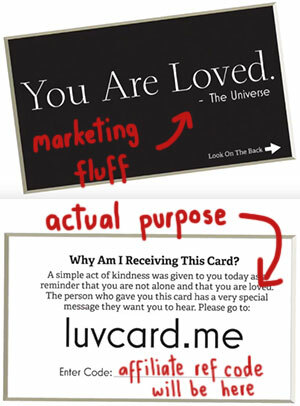 Love cards are real-world postcards, that Luvv affiliates hand out in the hope recipients will sign up as affiliates. Love wear is apparel featuring love themed prints. How affiliates acquire love wear is unclear. Love cards are printed with Facebook meme style “love” messages, but ultimately they’re little more than a recruitment marketing tool. The main objective of each (postcards and apparel) is to bring people to an awareness of our movement and invite them to participate in it. “Participation” in Luvv boils down to paying affiliate membership fees, which fuels the company’s MLM opportunity. Each paid Luvv affiliate receives 100 love cards. Affiliates also receive access to social media spam tools, which allow them to send out pre-written love messages. Each of these messages has the Luvv affiliate’s referral code attached to it. To be clear, there’s nothing wrong with trying to brighten up someone’s day with a message of love and support. But not when it’s just a front for pyramid recruitment. Like all pyramid schemes, Luvv will collapse once recruitment bottoms out and fees stop getting paid. SCOTT CHANDLER, one of the crooks from the Jet-Coin BTC Scam, was also behind AutoXTen you mentioned along with fellow fraudster Brent Robinson. I hope we hear news soon on the indictment by the FTC on Scott Chandler, it’s time this snake pays for his crimes. 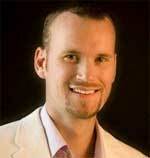 This scammer is famous for not paying people from 1OB and other programs he started. It was first shown to me in May 2018 and my immediate reaction was ponzi. Already banned from my Facebook groups. Don’t join on that LUVV full of hype and Jeff is not paying commission. Long opened up additional “LUVV founder” investment opportunities, and a marketplace to sell LUVV gear, then never announced how those sales were doing. The “founders” never got a dime of what they were promised, and even paid affiliate members stopped getting their commissions. Long announced a change to affiliates only receiving payment after their commissions reached $25 late in the game, so no one got any more money after that. He’s stopped telling any of the 1,000 members what is going on, and no one can reach him. He’s now blocking everyone who questions what he is doing, including blocking investors. @SueRouse Yep. I bought “founder positions” now the site is gone. He is a scammer. Yep been there , get paid social. Failed. Crypoplayers club. Failed Luvv. Failed jeff long owes me over 800 dollars, is a serial scammer and should be brought to book by law enforcement or those of us scammed should launch a class action.